Some times I make mistakes when soldering and small pieces of silver melt too much (ekkk!) 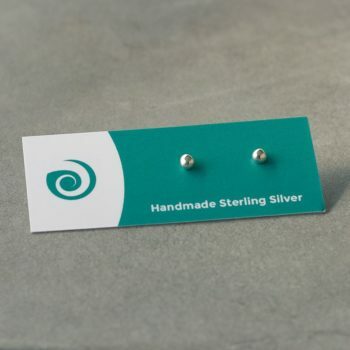 – but I instead of thinking of these as mistakes, I make them an opportunity to learn more about how silver works under heat and what levels you can push the metal to. So, these small “mistakes” get cooled, then popped into my scrap jar. 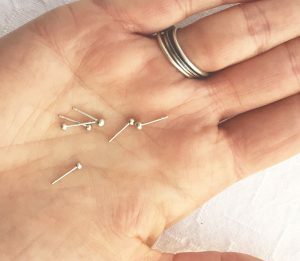 Most silver companies will take in your scraps and exchange for money or new product (sheet or wire)… but as i’m very careful when cutting and designing my pieces it takes a looooong time to collect enough scraps to make it worthwhile sending them in. 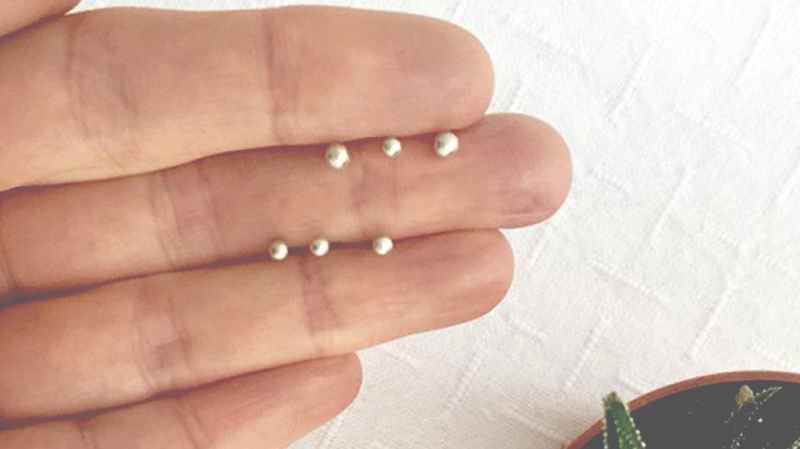 The other week I had a lightbulb moment – to further melt the small scraps into nuggets, then make them into studs! I simply melt the silver until it forms a ball, leave it to cool and pickle to clean it. (I only use eco-friendly pickle in my studio, not any nasty chemicals – check out the recipe here). Then, I solder on a stud post and pickle it again. It’s then time to sand the nugget – they don’t need a lot of sanding, just a light sand to smooth the surface. Then it’s into the tumbler for two rounds – the first I put in some cutting compound (powder) which finely cuts the surface of the metal to smooth the sanding lines. The second round I put in some polishing compound which gives the jewellery a beautiful shine. Once the studs have come out of the tumbler and dried off with a silver cloth, they are ready to be shipped to a new home! 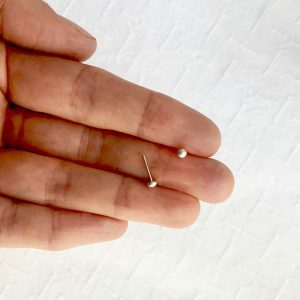 Being mostly recycled, these super cute, teeny tiny studs go perfectly into our Mini’s Range and at $12 a pair (with free shipping) who can resist! 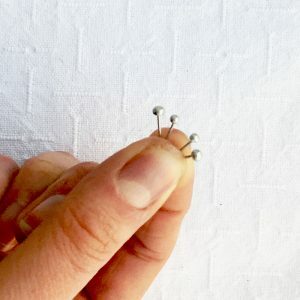 This entry was posted by Lauren Batten in Jewellery Stories and tagged bench, jewellers, nugget, stud, studs.